Beautiful old farmhouse on two acres of terraced olive groves. The main house has 4 double bedrooms and 3 bathrooms. The master bedroom has a large en suite bathroom, with an antique French roll top bath plus seperate shower. Excellent new kitchen with small breakfast table, La Canche range cooker with two ovens and five burners. There is an open plan sitting/dining room with French doors opening onto a wonderful, large summer kitchen. You can eat at an old marble tale which can seat 12- we have a gas-fired BBQ, a second dish-washer and another fridge. A large seating area around the fire place is ideal for cool Spring and Autumn evenings. Lovely extended gardens; willow trees surround the pool and give perfect natural shade for hot summer days. We have built a good size boule court adjacent to the summer kitchen ( boules provided!). There is also a smaller garden house, which can sleep a further 4. I double bedroom and 1 twin. A charming kitchen and sitting room with own satellite TV. The village: Seillans is officially rated as one of the most beautiful villages in France. It has a population of some 1,600 people with narrow, winding medieval streets.There are excellent restaurants. Les Deux Rocs with a beautiful outside terrace. Chez Hugo chef owner , with delightful imaginative cooking. Gloire de Mon Pere with tables under the plain trees in the village square . Hermance Caro, now runs the Michelin starred Castellaras which is between Seillans and Fayence. Seillans has a post office with a 24-hour cash point machine two boulangeries,chemist, newsagent and pizzeria, all five minutes from the house by car. There is a medium-sized supermarket,Huit A Huit,at the entrance to Seillans. 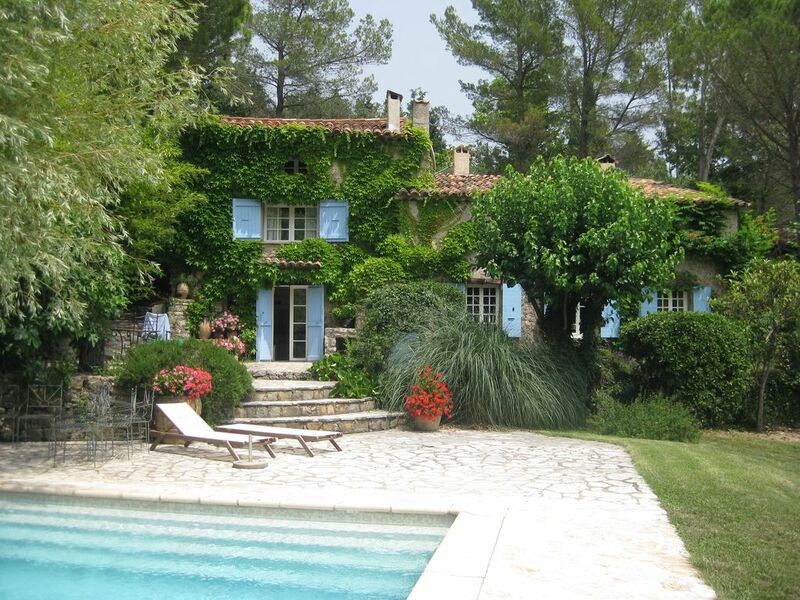 The area: Our village is forty five minutes drive from Nice airport and Cannes is thirty five minutes. In the high season the car trains come to Frejus, the nearest point on the coast from house, perhaps twenty-five minutes. Twenty minutes to one side of Seillans brings you to Bargemon, about ten minutes the other way takes you to Fayence, larger than Seillans with a large hyper-market and one of the best boulangeries in the Var and a twice weekly market. Recreational facilities: The village has excellent tennis courts and there are a wide choice of golf corses in the area. There is a fantastic golf complex, Terre Blanche, between us and Lac St cassien;15 minutes away. We have another golf course near Le Muy about 25 Minutes away. Lac St Cassien, twenty-five minutes away, is a large inland lake with beaches, pedalos and lake-side restaurants. Fayence airport is one of the leading glider airports in Europe (and has a great value for money restaurant). We have two superb vineyards ten minutes from us: Domaine des Selves and the, multi-award winning, Chateau d'Iris. We bought Lou Pin dei Sace in 1994 and have rented the property every year since then while using it ourselves as much as possible , it is very much our second home which we are delighted to share with our guests. We were theatrical agents in London , our agency was founded in 1966 and we handed it over to the three agents working for us in 2002 and took a very happy retirement dividing our time between London and Seillans. Our two children have given us five grandchildren who come to us in France several times a year so we have a good understanding of what gives children a happy and productive time in an area with so much to offer. We are delighted to share this as we like to liase with our guests as much as possible and are always willing to offer help and advice. Guests in the past have often used the same words to describe Lou Pin dei Sace: preaceful and tranquil . SItuated five minutes outside the village it sits in a bowl in the forest with open views over two acres of olive groves towards the hills in the distance. Yet there is so much to do in the area. The Lac St Cassien with all its water sports, nearby hill walking, tennis at the village club are perfect for those who like to be active yet the beaches of the Riviera are so close , thirty minutes to Frejus, forty minutes to Cannes. But the property is less than an hour from Nice Airport! And then there are so many good restaurants around us, three very different ones in Seillans itself . Within ten minutes are two highly respected and welcoming vineyards, Val d'Iris and Chateau des Selves. There is a particular satisfaction to enjoying chilled rose on our terraces which came from just down the road! Two of the bathrooms are very spacious and have large old French roll top baths plus seperate shower enclosures. The cottage has a new shower room with huge rain drop shower head. The master has air conditioning all the other rooms have large fans. Electric Heating throughtout. Heated towel rails in the two large bathrooms. All our linen is top quality from The White Company, Cologne and Cotton or the equivalent. The summer has a wonderful big fire place for cool evenings. There is also a good size fireplace in the main living room. All towels are top quality , we also provide seperate pool towels. Lovely living room as shown in our photos which leads on to the summer kitchen terrace . Main kitchen 5 burner hob with griddle plate..
Main house: Excellent Provençal kitchen with 5 burner La Canche cooker with 2 ovens. N'espresso coffee maker, toaster, micro wave Exceedingly well equipped. Cottage: micro wave etc also well equipped. There is a large old French farmhouse table in the main house and a wonder old marble table in the summer kitchen. We have a selection of toys for children especially younger children. Large garden with lovely terrace approximately 2.5 acres and over 50 olive trees. There are also lovely large open spaces for ball games etc Boule court on one of the terraces near the summer kitchen. Lovely balcony outside one of the main double bedrooms. Chairs for sitting looking at the wonderful view down the valley . Can be hired at the Lac St Cassien 20 minutes Rafting and Rapids are about 40 minutes away. Bicycles can be hired locally. Pedaloes can be hired on the Lac St Cassien 20 minutes drive. Cannes,Frejus, endless boats for hire. Large terraces around swimming pool and the summer kitchen . The whole property has wonderful old olive terraces. Nearest skiing: Audiberg 40 Minutes and Grenoliere Sur Neige approx 1 hour. 3 lovely courts in our village of Seillnas ,five minutes by car. Large pool 11m x 5 m. There are three steps at the shallow end, the deep end is very deep suitable for diving. We know several excellent caterers in the area who will either deliver food to you or come and cook on the premises. Valerie,our gardien, can easily arrange babysitters. We enjoyed our vacation in Seillans. Unfortunately the many stairs were not suitable for my husband who has back problems. We did have a good family reunion. The heat was somewhat a problem for the ones without air conditioning in their rooms. Enjoyed the summer kitchen. Some of the lights there never worked. We are delighted that you had a good family reunion and enjoyed Seillans. We are quite proud of what we provide and are always happy to welcome back returning guests. Yes, as you indicated in your heading, 2018 is proving to be a near record-breaking hot summer all over Europe (including England!). In normal conditions our guests using the fans provided in the three non air-conditioning bedrooms find that they work well. But it has been quite an exceptional year. We do wish you had contacted us about the problems with some of the summer kitchen lighting. The dimmers are eccentric but we could have advised you on how to make them behave. As soon as we read your review we contacted our current guests in case there was a particular unexpected problem needing our electrician to have a look; but they report that all is well and that all the lights are working . Hopefully, you will find your way back to us in Seillans sometime in the future. An Utter Delight - book now! I cannot recommend this property enough. We have just returned from two weeks of complete bliss. We were a party of 12 covering every age from 4 to 85 and every single person had a holiday that suited them down to the ground. Denise and Scott are the perfect hosts, ensuring that every aspect of our stay was perfect, warm, welcoming and relaxing. It honestly was like staying in the house of dear friends. The property is wonderful, beautifully decorated, child friendly and a with real, fully equipped cooks kitchen - two kitchens in fact with the amazing outdoors area - something you rarely find in holiday lets. The gardens are idyllic, peaceful and completely secluded, the pool is large and deep, perfect for keeping cool and relaxing or indeed for keeping four energetic boys entertained all day! Also the comfiest sunbeds I have ever encountered in all my year of holidaying- and more than enough for everyone ensuring no fights! Bedrooms are cool (all with fans for those particularly hot provencal nights), simply yet tastefully decorated and the annexe/cottage is a great addition for those who like to sleep in and not get woken up by rowdy youngsters. From a well stocked collection of bestsellers, thrillers and literary reads, through jigsaws, board games (scrabble and scrabble dictionary!) boules court and a fabulous selection of pool toys, this home has everything any family would need to keep everyone happy. A short (5 min?) drive from the picturesque village of Seillans with cafes, restaurants and a local supermarket, and a 15 min drive from Fayence with a large hypermarket you'll be spoilt for choice with food whether you want to eat out or cook for yourself, and with all of the various terraces and tables back at the house you could eat in a different position every night, with a different gorgeous view, and never need to eat out at all! Jaques, Valerie and Nadine who help look after the house were all friendly and always on hand to help or answer a question, this is a home where you will be taken care of. To top off your break I would recommend a day at least at Lac du Saint Cassien, (arrive early for parking) swimming, pedaloes, floating obstacle courses and great lunches. For a truly memorable, relaxing and utterly delightful Provencale getaway, you will not find a better choice. Thank you for such a good review. We are so pleased that you and your family enjoyed yourselves so much. Hopefully, we will see you again? Where to begin?! Denise and Scott's fabulous home in Seillans was everything and more we could have asked for. From the classic yet updated French decor to the beautiful property with a full-sized pool, our stay was true perfection from start to finish! The fully equipped indoor and outdoor kitchens and living areas provided ample space for our family of nine to cook and lounge about comfortably. We especially loved the large outdoor dining table where we could sit, talk, relax and eat for hours on end. Our days began with the most perfect croissants and pastries from La Gourmandine (thank you, Denise, for recommending this wonderful boulangerie), enjoyed poolside while planning our day's adventures. Out favorite day trips included hiking through les Gorges de Verdon and enjoying a spectacular cooking class at the world renowned Chateau de Berne (an hours' drive from Seillans). Highly recommended! Denise and Scott suggested lovely dining spots, our favorites being Chez Hugo and Hotel des Deux Rocs, both located in the charming village of Seillans, which was a short walk/drive from the property. Thank you Denise and Scott for sharing your wonderful home with us. We are already planning our next visit! Thank you so much for the great review. You were perfect guests. We love it when people enjoy our house and the area as much as we do. We spent only one week in this lovely property and wish we could have spent the whole summer! The main house is large and comfortable and loaded with charm. The guest house is well-maintained and also quite comfortable. (The abundance of bath and beach towels was very much appreciated!) Our kids found the upstairs attic bedrooom a little too warm and stuffy, but with room for six in the other 3 bedrooms, sleeping arrangements were not a problem for us. And having 3 nicely renovated full bathrooms was very convenient. But the best part of this property is what is outside--the garden is simply beautiful with lots of space and activities for everyone (soccer nets, petanque court, swing set, benches for reading) and the outdoor kitchen with its large sitting/dining areas was wonderful. The pool seemed to always get sun which warmed the water but the many large trees provided welcome shade for the pool-side chairs. The nearby village of Seillans is a real treat to visit and our kids adored the facilities of Lac St-Cassien less than 30 minutes away. Denise and Scott could not have been easier to communicate with and responded immediately to any questions or concerns we had. Overall a highly recommended A++ property! Could not have been better. AMAZING, special place. We rented this home and the guest cottage for our family of four (two adults, one baby and one toddler), my husband's sister and her husband and toddler daughter and my husband's parents. It was FABULOUS. First of all, they have the most amazing taste - the entire home is decorated in this gorgeous french country style, with an amazing attention to detail. The kitchen (both inside and outdoor summer kitchen) are a true chef's dream, fully equipped. We did oysters, squid, grilled on both the gas and charcoal grill. The bathrooms all have both a fabulous bathtub and shower - the showers are tall and super comfortable. Strong wifi (a must) made the stay so pleasant. English TV if your kids need some TV time while you sip your coffee on the patio. The pool is amazing and has an alarm if you are concerned about the kids. Even little details like the sheets on the beds were amazingly comfortable. The grounds are breathtaking with a swing set and lush grass to enjoy while they run around. Denise and Scott think of EVERYTHING and are perfect hosts. And while you feel totally secluded and away from the world there are a few villages really close by where you can get anything you need. It was nothing short of perfect and I hope we can return one day!!! Thank you for sharing your beautiful house with us. We had the most perfect time and have completely fallen in love with it. I don’t know where to start. It was a complete home from home with everything provided: no having to buy ready ground pepper from the supermarket as you normally do when you rent; the SKY and WIFI meant we didn’t miss Wimbledon and were able to use our laptops to keep in touch with the world. It is a cook’s paradise, with every piece of equipment any chef would need. We read your cookbooks in the morning, shopped in the markets and indulged in creating gourmet meals in the evening in the beautiful summer kitchen. What a delight the summer kitchen is, being able to sit in such tasteful comfort, with everything (drinks fridge and ice cream fridge) to hand. The gardens are also lovely – so tranquil with gorgeous planting, not all hard landscaping like you get in many villas. And so many comfy seating areas in shady nooks and crannies to get the books read. I could go on and on but just wanted you to know that we all felt we couldn’t have found anywhere more perfect. I trust we took good care of your home, and we hope to return many times. We have already been discussing whether we could squeeze in another week in the autumn. This lovely, tranquil property is minutes by car from the medieval village of Seillans, one of the 'perched' villages of the Var it is annually selected as 'one of the most beautiful in France'. We are about forty-five minutes from Nice Airport and the whole of the Riviera is within easy access: you can reach the centre of Cannes in thirty-five minutes, Frejus and St. Raphael in a little less.Grasse in also thirty-five minutes away, the extraordinary Gorges du Verdon not much over the hour.